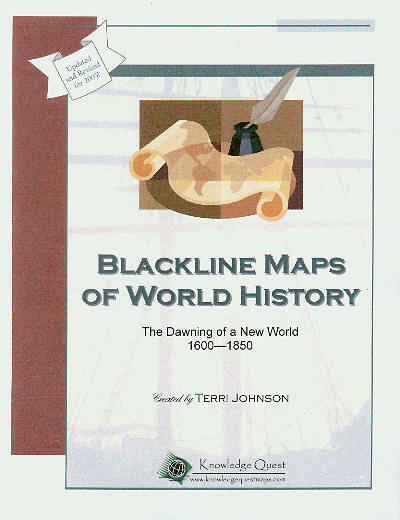 Our maps were designed to supplement your study of history during the elementary grades. For your convenience, they have been broken down into four time periods. This way, you may purchase all of them at once as a Complete Set, or only the time period you are currently studying. Click here to browse the Table of Contents. All printed maps are regular notebook size (8.5 x 11), hole-punched and ready to label and color, except for our Giant Mark-it wall maps which measure 24" x 30" in size. From the dawning of civilization to the barbarian invasion of Rome. 24 maps with lesson plans included. From the dark ages of Europe to the discoveries of distant lands. 24 maps with lesson plans included. From the colonization of the New World to the California Goldrush. 24 maps with lesson plans included. Covering the Crimean and Civil and World Wars to the recent attack on America. 27 maps with lesson plans included. All four time periods with lesson plans plus extra unlabeled maps assembled in an attractive view binder. Nearly 200 maps. A 30% savings over purchasing the map packets individually! Identical to the binder version, includes all lesson plans with links. Files are in PDF format. Mac and Windows compatible. Already have the original CD-ROM? Print this form for special upgrade offer. Identical to the hard copy version. All files are in PDF format. Mac and Windows compatible. Acrobat Reader included. These wall maps are printed on heavy 35lb paper. Many standard maps are available (see drop-down menu) or you may custom order the maps you want! Mention map titles in comments section. Click here for a complete listing from our tables of contents or call for more information: 503-663-1210. Looking for a bargain? Discontinued map sets for $5 each! Click here for details. Offer good while supplies last.